This is it, friends. The moment they tried to warn us about has come to pass. We ignored irrefutable proof that Justin Bieber is a lizard person, that Nicolas Cage is an ageless vampire, and that Taylor Swift is an Illuminati clone secretly leading the Church of Satan. But now we have clear photographic evidence that something even more twisted and disturbing is happening to our favorite celebrities: they’re growing extra limbs. 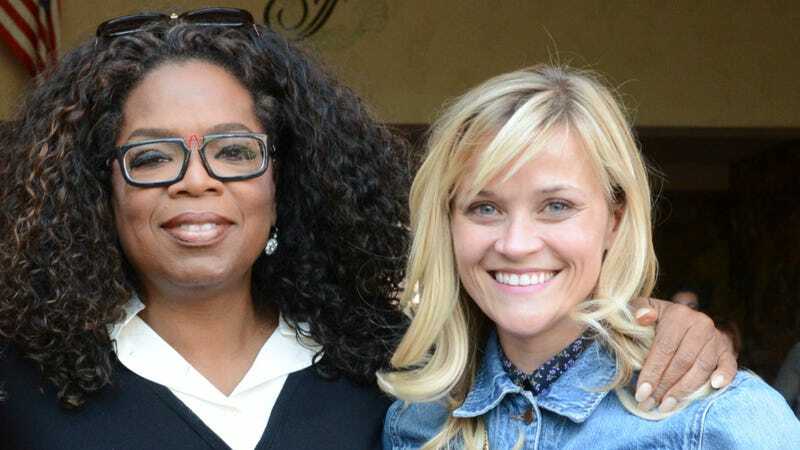 In pictures taken for Vanity Fair, a magazine sure to rue the day it exposed secrets better left alone, we see both Oprah Winfrey and Reese Witherspoon captured in their true form. First, eagle-eyed truth spotters noticed Reese Witherspoon’s entrance to a higher plane of physical existence. An extra leg, tangled in a strange nest of lower limbs, hints that she’s either been replaced with some arachnoid variety of clone or allowed herself to take on their DNA. For what strange purpose, we can only guess. As if visual proof of Witherspoon’s unsettling transformation wasn’t enough, Oprah, obviously hiding her extra limbs with great concentration in the cover photo, allowed a brief lapse elsewhere in the shoot. In another picture we see her smiling to cover the pain of an extra hand bursting from a previously covered flesh pocket, which emerges to grasp the hip of her mutated compatriot. This is all a lot to take in, but it’s our duty as vigilant, free people to grapple with so much new information—to try our best to discern the nature of these celebricreatures and what goals they may be working toward. What those goals are is difficult to say. But, coming so soon after Oprah’s flirtation with the American presidency (her recent denial of these plans is most definitely a waters-testing psy-op), we can assume the deep state has accelerated a program meant to give control of the free world to those strange beings covertly guiding our existence. Witherspoon, future vice president of Oprah’s 200-year term as commander-in-chief, may scramble to make light of these images, but it’s too late. The genie is out of the bottle; the alarm has gone off; the time to wake up to reality is now.